We have a large range of Heat n Eat foods. Come in and try our fresh chicken lasagne! They've just come out of the oven!. Come in and try our fresh tasty pies! Come in and try our new sun dried tomato, fetta and basil pesto pork fillets. 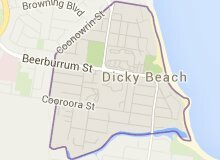 Hi and welcome to Dicky Beach Family Meats. We are a family owned and operated butcher shop, servicing the Sunshine Coast, Caloundra, Currimundi, Mooloolaba, Palm View, Pelican Waters, Caboolture, North Lakes, Strathpine, Brisbane and areas in-between. The above 3 pictures are examples of our "Heat n Eat" range. We also stock various lines of, Flavoured Ready to Cook meats and to add the additional flair to your meals, we also have pancetta, various salamis and Bunny Chow Down mustards and pickles. Have a look at our smallgoods range - tasty pancetta! It’s versatile and delicious - use on a beef sandwich for a little pep. We have a large range of salamis now - just ready to slice and take home!